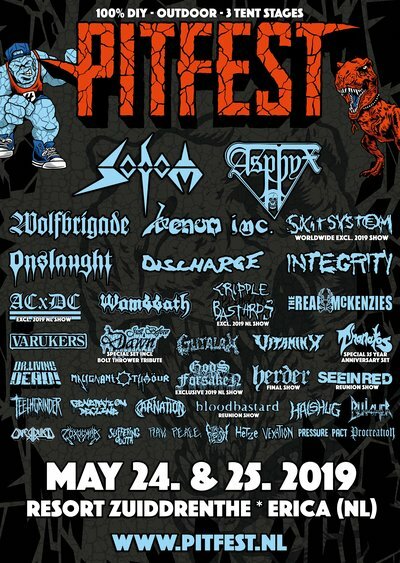 April 6, 2017 | AFAS Live, Amsterdam – Dutch metal first, Swedish metal second! 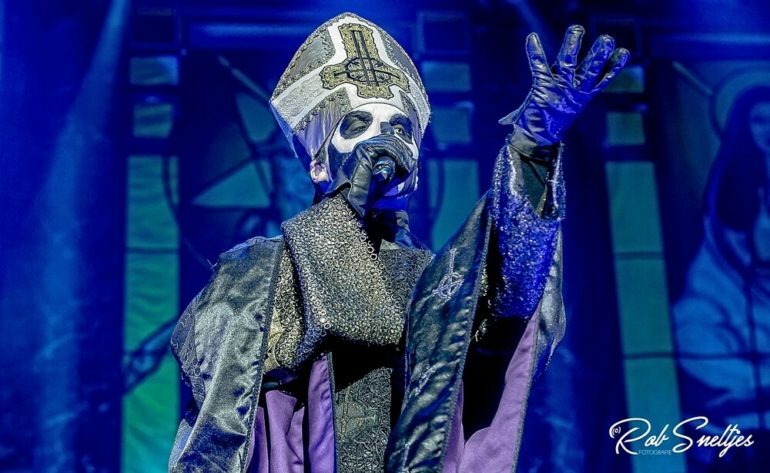 The rock/metal sensation and Grammy Award winning band Ghost is visiting Amsterdam as part of their ‘The Popestar Tour’. The band already played some shows in the Netherlands, but never did a clubshow in such a large venue as AFAS Live in Amsterdam. The tour is named after their most recent EP ‘Popestar’, which includes 4 coversongs and one new song. Support act this evening is the American synthwave/progressive rock duo Zombi. Pictures are made by Rob Sneltjes. While listening to some ‘Rush-look-a-like’ progressive/synthwave rock music of the band Zombi, the waiting for the headliner has already begun. I mean, there’s nothing wrong with a support-act warming up the audience, but in this case it was not really working out… Nobody was paying attention and I totally understand why. Two guys jamming around on a keyboard and drums… So, what I said before, the waiting for the headliner already started! 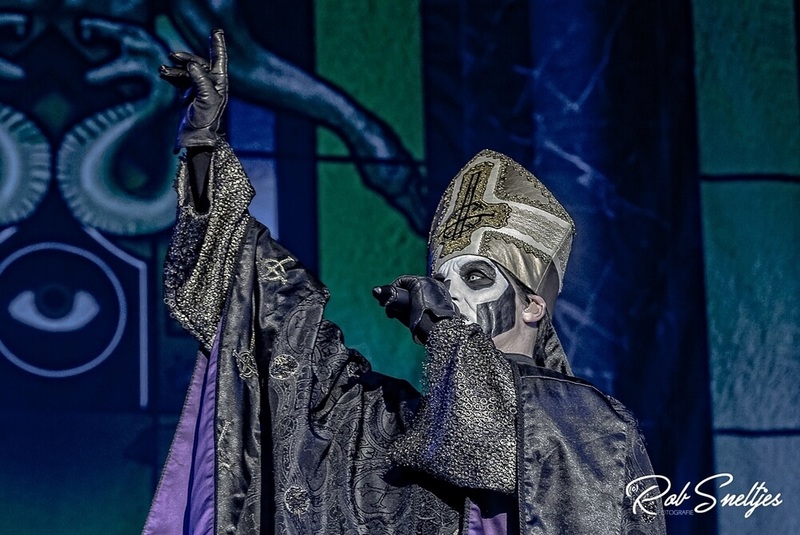 After a long intro (Masked Ball from Jocelyn Pook), Ghost shows up and is immediately starting heavy with the songs ‘Square Hammer’ and ‘From the Pinnacle to the Pit’. You really don’t know where to look, because there’s happening a lot in the theatre that’s transformed into a dark church. 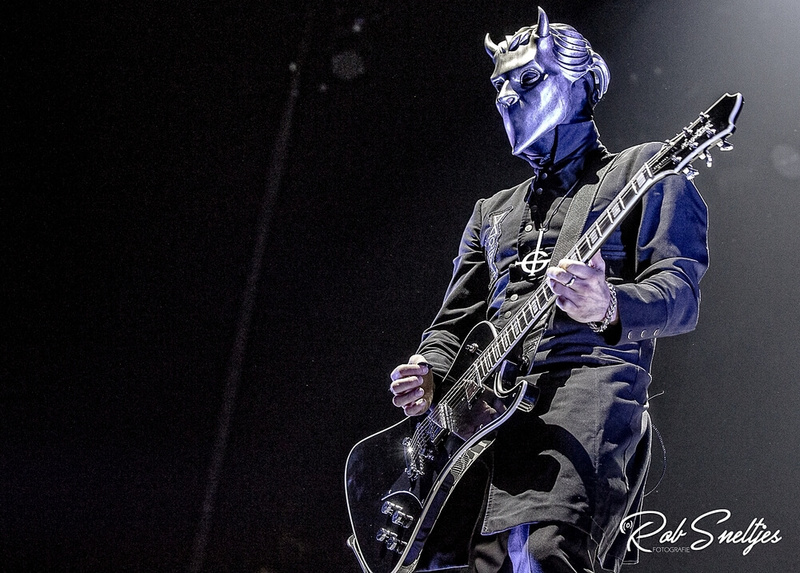 Nameless Ghouls running around and Papa Emeritus is doing his act. Musically and performance wise it’s just one big oiled machine and every detail is covered. They play effortless together and especially the twin guitar solos are a feast for the ears! It’s the combination of the heaviness and the great composition of the songs. I’ve been a lot of times in AFAS Live (the previous HMH), but it never sounded so splendid like this time. In stead of being in a large hall, it sounded like you’re listening to a Ghost CD on your sofa in the living room. Especially the sound of the guitars is magnificent heavy and tight. 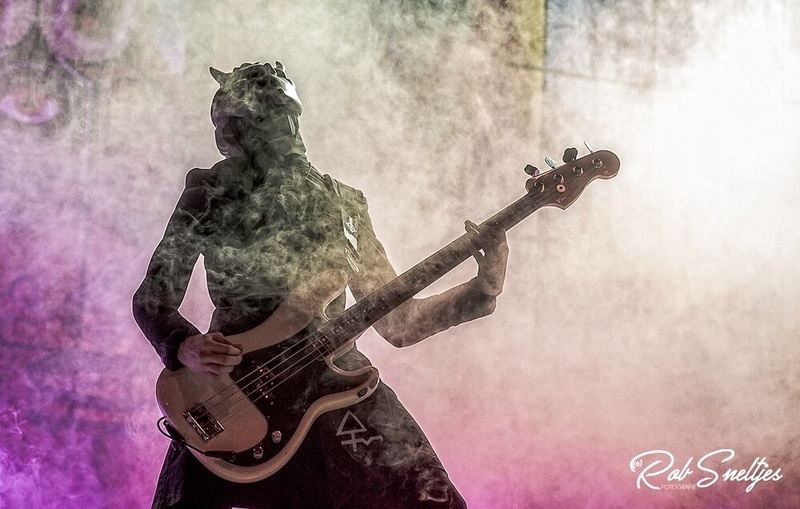 Like a wall of sound that’s coming to grab you. Comparing to their older songs, their new songs of the latest album ‘Meliora’ sound the best in this quite large venue. 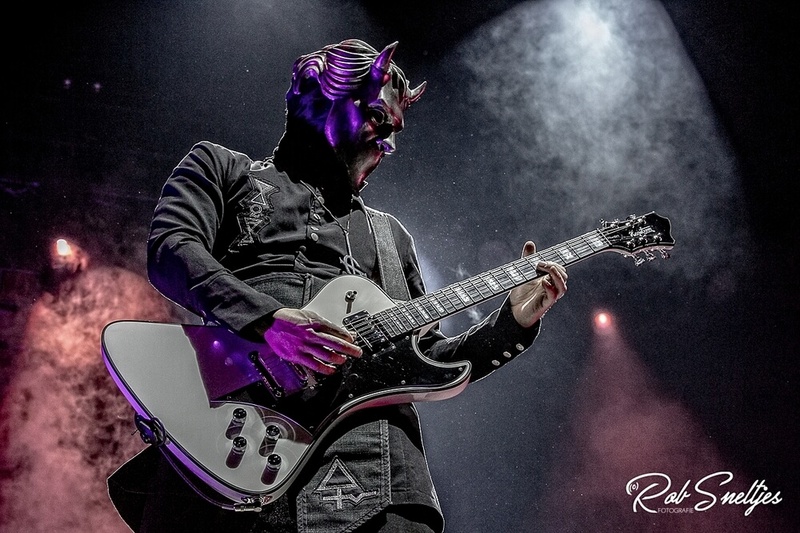 Songs like ‘From the Pinnacle to the Pit, ‘He Is’ and ‘Absolution’ seem te be written for such places and sound very full and warm. During the song ‘Mummy Dust’, the audience is treated to confetti and Ghost-dollar bills. Of course the whole show is slightly over the top, but the guys on stage are aware of it and are joking and acting their asses off. 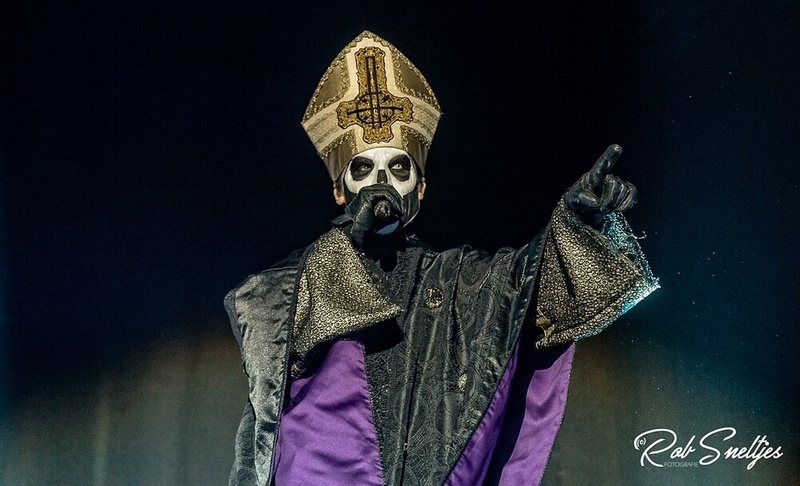 Especially vocalist Papa Emeritus is talking a lot and seems to have a good time here in Amsterdam. The audience is also clapping, singing, drinking beer and having a real good time. Nothing’s going wrong, everything is just managed into perfection. 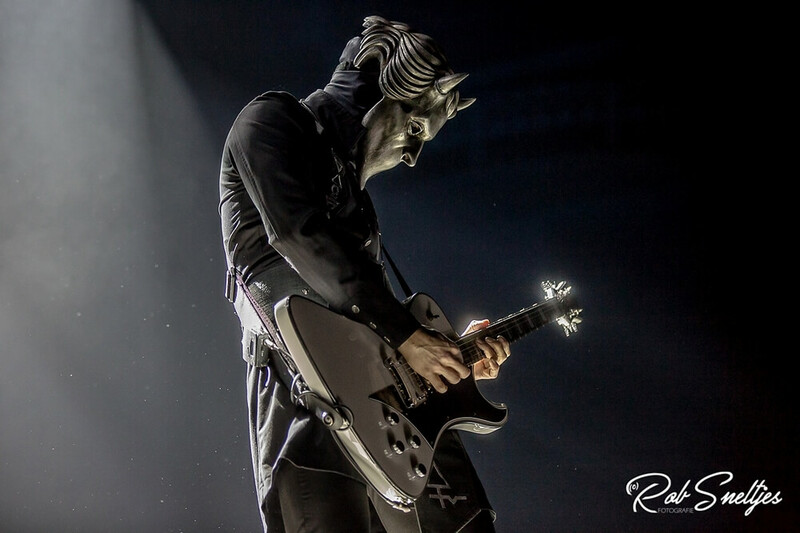 During a show of Ghost you get the whole package, that ensures you have a great evening, including all the ingredients of action, metal music, theater and great songs. It’s not the most fast and aggressive band, but it’s a kind of delight to see this band performing and at the same time their music is heavy and pumping like hell. For me they are one of the best metal bands at this moment. Without any doubt. Next stop in the Ziggo Dome?